Vent installations each have their own unique style and needs, which is why Selkirk provides this adaptor that helps make ventillating your chimney much easier. With this connector, you can connect your stovepipe through a chimney wall with as little as 6 inches of clearance. 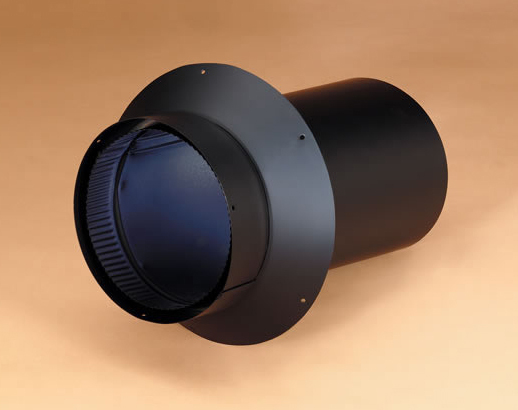 This accessory is available both in 6 and 8 inches in order to accommodate your ventillation needs, and the scratch resistant black color allows it to blend in with most vent systems. Whats the difference in using this Selkirk DSP double-wall black stovepipe masonry adaptor vs a wall thimble? This part essentially takes the place of a thimble in a masonry application. The part is not insulated for use through a combustible wall however. Do you use furnace cement to secure this? Is the attached collar is in the way when applying the furnace cement? Indeed, furnace cement is suitable for this application. To install, the adapter would be placed partly into the hole prepared in the clay pipe (leaving room to work behind the collar). A bead of cement would be applied onto the adapter just behind the collar. When the collar is pressed fully into the clay pipe, the cement will seal the gap between the adapter and the clay. Can you attach a 6 " double wall stove pipe directly to this adaptor? Yes. In fact, that is its prime objective. It is part of the Selkirk DSP Double-Wall line. I was very pleased w/ this pipe adapter. i didn't want to make my entire pipe double wall b/c of heat loss and cost so i got this adapter to fit inside of my chimney thimble and was able to connect the single wall corner directly into it. have been burning a fire for weeks now and no problems; often feel around it and the other wall protection and find nothing warm to the touch! Exactly as advertised. I reviewed several websites before finding the best price here. Prosdouble wall stove pipe stays remarkably cool on the outer surface.